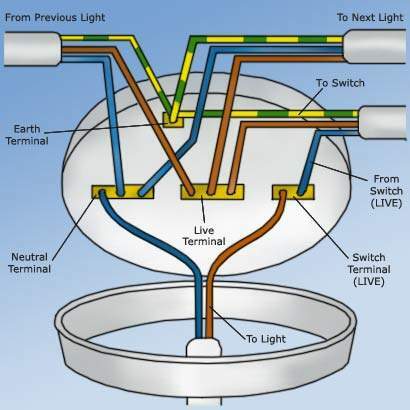 Any electricians here, need help wiring Ceiling light rose. taken down a 3 bulb ceiling light, replaced with a single basic ceiling rose. when I took down old one there were 4 red wires and 4 black ones, although 1 black wasnt connected to anything. I have put it all back up, all 4 red going to the live brown(in rose) and 3 black going to neutral blue (in rose). The light comes on but the dimmer isnt working and it also isnt going off. There's a reason it's now illegal to DIY many jobs like this. Are you sure the light fitting is suitable for a dimmer? Are you sure the black wire you said was doing nothing didn't have a red sheath on it to confirm it was live ? Also the 3 red wires have to go together as they are on a ring as in Greg's diagram. The ceiling rose has nothing to do with whether the light fitting is dimmer compatible. You should be able to identify the cables to suit the diagram, you should then be able to determine where you are going wrong. Is your cabling as per diagram? .yep all red wires are together (4 of them) and all 3 black are also … .yep all red wires are together (4 of them) and all 3 black are also together, with the loose black wire.Gregs diagram shows 3 wires in the ceiling mine had 4, hmmlooks like i will have to go up there tomorrow and do a bit of moving the blacks together trying to find the light switch wire. Correct me if I am wrong, you are not wiring up a light switch...you are replacing a light fitting which also requires replacing the ceiling rose...rather more than wiring up a light switch. In fact, if it were a simple, safe, task...you might not be on here asking how to do it. ok dont slate me for asking ... but you havent put an energy saving bulb into the fitting have you ? just wanted to check coz they dont work right in dimmers. You are seriously misunderstanding the law, you can't do electrical work in the kitchen, bathroom or outside, without it being inspected by a local authority building inspector. ok dont slate me for asking ... but you havent put an energy saving bulb … ok dont slate me for asking ... but you havent put an energy saving bulb into the fitting have you ? just wanted to check coz they dont work right in dimmers. The expensive dimmer energy saving bulbs do, about £7.99 per bulb though. You are seriously misunderstanding the law, you can't do electrical work … You are seriously misunderstanding the law, you can't do electrical work in the kitchen, bathroom or outside, without it being inspected by a local authority building inspector. Correct + adding a new circuit to the fuse box requires inspection. Also all electrical work must be done by someone who is 'competent ' (although there is no legal definition of what competent means). OP, I did actually type out all the information you needed to get your light working but i've just deleted it all. Without sounding like i'm ranting , ive witnessed qualified electricians who have had pretty bad accidents ranging from having they eyelashes burnt off to a guy who had really bad burns to his legs! Another thing to contemplate is when you finish meddling and your house burns down due to an electrical fire, how you gonna feel? I might be wrong, but I think you are wrong. Part P states very clearly what you can do inside a kitchen without notifying the authority (or getting it self-certified). It includes replacing the light fitting, damaged cable for a single circuit and replacing sockets. Correct + adding a new circuit to the fuse box requires inspection. Also … Correct + adding a new circuit to the fuse box requires inspection. Also all electrical work must be done by someone who is 'competent ' (although there is no legal definition of what competent means). I think it's pretty clear from this thread that "competent" does not include somebody who messes it up and then comes to a money saving forum asking for help. I'd strenuously argue that the OP isn't competent and therefore he is breaking the law with his guesswork. I think it's pretty clear from this thread that "competent" does not … I think it's pretty clear from this thread that "competent" does not include somebody who messes it up and then comes to a money saving forum asking for help. I'd strenuously argue that the OP isn't competent and therefore he is breaking the law with his guesswork. have removed my gas oven, fitted in an electric one had to extend an existing oven cable further down to allow cooker cable to reach (done it by the book), installed under cabinet lighting with fused socket thing, changed the light fixture in the kitchen, swapped the extractor fan off the cooker mains ring onto the socket ring. Replaced front and back outdoor lights, installed new socket in spare room, new socket in main room. Reconnected one of those old circle plug sockets that had been disconnected to 2nd ring main, updated to BS plug. I feel I am now competent in electrics. I'm now going to be installing a ceiling extractor fan and shaver socket in my bathroom, also uprating the recessed lights to zone 2 spec. LOL, not gonna bite, I'll take that as the joke you meant it to be. Tell that to John Doyle who played for Celtic - killed by electrocuting himself doing work in his home years ago. God knows how i survived the 5mm hole being blasted through my pen knife scissors. I guess i wasn't properly earthed. God knows how i survived the 5mm hole being blasted through my pen knife … God knows how i survived the 5mm hole being blasted through my pen knife scissors. I guess i wasn't properly earthed. I think one part of you may have been damaged that you are not aware of. So where's your switch wires then? So there are no earths at all? How many seperate cables have you got going to the rose i.e how many cables not single wires? This looks like guess work to me - "looks like i will have to go up there tomorrow and do a bit of moving the blacks together trying to find the light switch wire." If it were copycat, your switch would work...it doesn't. Somewhere along the line you got it wrong because, ultimately, you don't know what you are doing. A proper spark would use training, experience and a cable tester. the electric is off, until I am safe and certain all is fine. How do you know your switch doesn't work then? If it doesn't, why did you turn the power back on? all i am doing is swapping an old rose for a new one, and I am quite … all i am doing is swapping an old rose for a new one, and I am quite competent in electrics and when I am not I get someone in. I think that being earthed was the problem. hu? as long as you are not earthed you won't get electrocuted. That's what the video shows and the comments talk about. With enough potential difference, anything can be considered earthed. can we neg the OP yet?